The RAC has launched the most comprehensive vehicle hisory check available in the UK with a view to reduce the risks involved in buying or selling a used car privately. Whether buying or selling a car, RAC the Motorist’s Champion provide the most comprehensive car check in the UK. RAC Vehicle History Check gives the vehicle history unique to the car and essential advice from motoring experts. Buying a car, motorbike or van? Check the history first with our Buyer’s Report. Get an instant Buyer's Report to give you the confidence before you buy! The RAC found only 10% of used car buyers actually check a car before buying it! The RAC data - taken from over 21,000 checks - found that 23% highlighted issues of concern, including: 12.5% with outstanding finance; 9.4% had been recorded as an insurance write-off; 0.8% had undergone a colour change; 0.1% recorded as having been scrapped; and 0.05% marked as stolen. 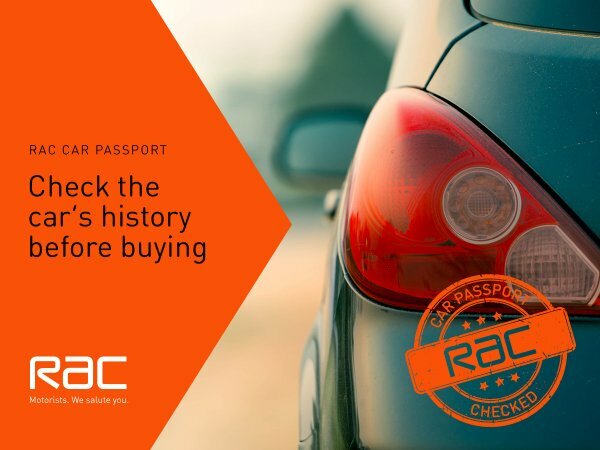 A separate study of drivers who had purchased an RAC Vehicle History Check found that 33% decided not to purchase the car they were looking at based on the information they received in the report, which takes a minute online. From time to time we are able to offer exclusive discount codes on CarDataChecks.co.uk so please keep checking back! Please see the RAC website for further details on terms and conditions as we cannot gurantee the up to date accuracy of the information provided.